Radio Chio is the name for the collaborative works of Bugbyte and Delade, a husband and wife team of creative individuals based in Buffalo, New York. Together, we create comics, games, stories, and other products from our all-too-vivid imaginations. Bugbyte, still hotly debated to be “maybe-an-AI-maybe-not-an-AI”, has worked on Messenger and Follower for the past ten years since her installation and deployment, along with other comics. Bug creates all of the artwork for Radio Chio, and is also frequently involved in creating new concepts and writing comic scripts. She loves video games involving monsters, and is looking forward to adding even more marathon medals to her stack of three. Oh, and she loves cats. Bug has been featured in the Creator Spotlight Series on Your Webcomics! Bug has a Twitter, a sketchblog, and a DeviantArt page. Striking from a hidden base, Delade has won his first battle in the publishing world by writing for his first webcomic, Follower. He is a big space and science geek, and loves talking about the latest advancements in aerospace and astronomical discoveries when he’s not writing or catching up on books or games. 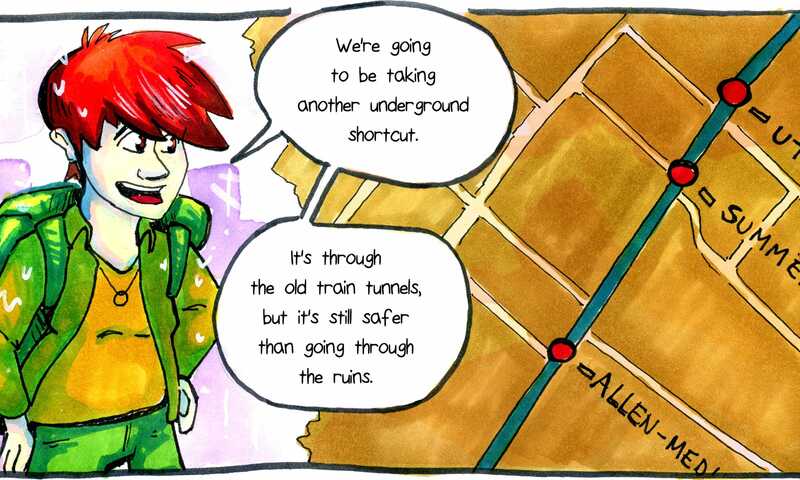 Delade writes the story and script for Follower, frequently edits and contributes to Messenger, as well as other comics.